In this economy it’s nice to see the success and growth of Deanna Frieze’s OC-based Fresh Produce Handpicked Stores. She opened Fresh Produce on Balboa Island in 2006, and now she boasts five new stores, along with two boutiques: Sunny Days on Balboa Island and Sadie Devaney in Laguna Beach. And she’s offering a special to Greer’s OC readers through Christmas Eve: Receive 20% off entire purchases (excluding Brighton, Troll, and sale items) just by mentioning Greer’s OC. This offer is valid at all of Deanna Frieze’s stores throughout the area. Sunny Days is the newest retail shop on Balboa Island. It’s more upscale than Fresh Produce and offers a variety of women’s clothing, footwear, and accessories from Allen Allen, Kut jeans, Pete and Greta, Born Crown, FitFlops, John Wind, and many more. Open 10 a.m. to 6 p.m. 304 Marine Ave on Balboa Island. 949.566.9001. Sadie Devaney is Deanna’s newest creation along with co-owner Jenn Haney. 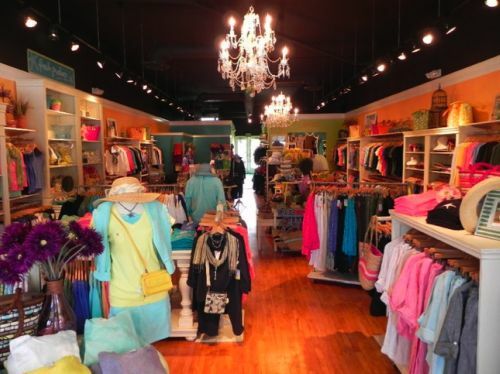 The new boutique has a wide assortment of women’s clothing, jewelry, and accessories. Open 10 a.m. to 7 p.m. Sunday through Thursday; 10 a.m. to 9 p.m. Friday and Saturday. 269 Forest Ave., Laguna Beach. 949.494.2233. Fresh Produce Handpicked Stores brings classic Fresh Produce style consisting of women’s apparel including tees, tanks and shirts, skirts, pants, jackets, dresses, and loungewear. And Deanna adds a new flare to lifestyle shopping by mixing the Fresh Produce label with other brands such as Fit Flop, Vera Bradley, and Trollbeads. 4718 E. 2nd Ave. in Belmont Shore in Long Beach. 562.439.4709. 130 Yale Ave. in Claremont. 909.625.5666. The first drive-thru Panera Bread in SoCal opened its doors today at 6 a.m. in Brea. When you order their special gingerbread man cookies today, all proceeds will be donated to the Make-A-Wish Foundation of Orange County and the Inland Empire. The Brea bakery-café is perfect for breakfast, lunch, dinner, and offers a full array of cafe, signature and hot panini sandwiches, salads and soups as well as the bakery-café’s signature bread loaves. The bakery-café‘s welcoming atmosphere has a wide variety of bagels, pastries and sweets, smoothies plus specialty coffees and espresso drinks that you can enjoy while emailing thanks to its free WiFi. Open 6 a.m. to 9 p.m. Monday through Friday. ; 6 a.m. to 9 p.m. Saturday; and 7 a.m. to 9 p.m. Sunday. 423 S. Associated Road in Brea. 714.706.5200.